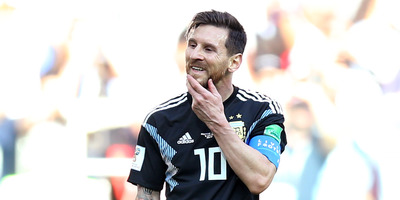 Gabriel Rossi/Getty ImagesIceland may be the smallest country to ever qualify for the World Cup, but they proved they can play with the best in the world with a opening draw against Argentina that included a crucial missed penalty kick by Lionel Messi. Iceland played to a hard-fought draw with Argentina on Saturday, continuing the tiny country’s astounding run of international football. After falling behind, 1-0, early in the match, Iceland kept its composure and responded soon after, with Alfred Finnbogason scoring his country’s first ever World Cup goal to tie the game. Messi was visibly frustrated throughout the match, especially in the moments that followed his missed penalty kick. Iceland’s defence was able to hold through a few more Argentinian attacks, and the match ended in a 1-1 draw with each team earning a point towards advancing towards the knockout stage. For Messi, the result is nothing short of devastating. Just a day after Cristiano Ronaldo carried his team to a winning draw against Spain with an unreal hat trick, Messi’s crucial miss and failure to finish led Argentina to a losing draw. Anyone actively arguing the Ronaldo side of the Messi-Ronaldo debate will no doubt look to the past 24 hours for years to come.